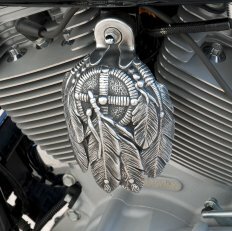 All of our horn covers Fit '92 and up Harley-Davidson® with side mount "cowbell" horn cover and all V-Rod® models. Will fit most earlier models with the purchase of a new (smaller) horn from H-D® , part number 69060-90D or any of the aftermarket catalogs. V-Rod® application requires mounting behind original mounting tab. Use original horn and hardware on all applications. 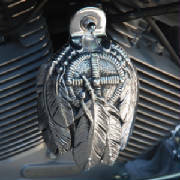 Winged skull horn cover does not fit V-Rod® . All refunds or exchanges must be authorized by calling 1 (450) 377-4224 8:00 AM -6:00 PM Eastern Standard Time. Return items must be post marked no later than four business days after you receive item. SHIPPING: USA $10.00 horn covers via USPS Priority Mail. CANADA: $35.00 horn covers ,$30.00 smaller items via USPS Priority Insured Mail. ALL OTHER COUNTRIES: $35.00 small items, $45.00 horn covers via USPS Priority Insured Mail. Out of country shipping multiple items may raise the price $5.00 - $10.00. You will see your shipping charge before you make your payment through our secure checkout. Medicine Bundle Horn Cover in highly polished marine grade aluminum finish. Designed to go with our Medicine Wheel air cleaner cover insert, backrest insert and derby cover.Marine grade aluminum is used on many boat applicatons such as steering columns and rails. It has a mirror like finish that holds up to the elements really well and only requires occasional polishing.Cast in the USA from hand sculpted original. Medicine Bundle horn cover in aged aluminum finish. Designed to go with our aged aluminum Medicine Bundle derby cover.Cast in the USA from hand sculpted original.